It's crunch time lately at work. I have a lot of data to analyze for a conference coming up and a paper I need to write. When I'm not thinking about my endless to-do list, my mind is wandering to my ModCloth Love List. (If you make an account, you can "love" things, which saves them to a list that you can view. It's nice for keeping everything you love together! If you don't have an account, feel free to use this link to sign up. You get $15 off your first order of $50+ and free shipping!) Here's a few things on my ModCloth Love List that I am lusting over this month. I don't need anything, especially with Christmas coming up (and snow tires to buy...yay), but it's fun to dream! These items scream late fall/early winter to me. Velvet, If You Please Dress in Merlot -- I've been dreaming of the perfect burgundy velvet holiday dress for a few years now. Unfortunately, this one is out of stock and won't be coming back. I'll have to keep my eyes out for a new one! Logging Miles Boot in Black -- This faux-shearling lined chunky winter boot would be perfect when the snow starts falling (and sticking). 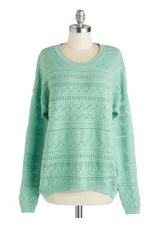 Baking Day Sweater -- This long, mint green sweater over a pair of black skinny jeans and black booties would be DARLING. I love the color for winter. I hope it comes back in stock in my size! Glad Student Coat in Camel -- The color of this coat goes with anything and everything, so naturally, I love it. I've been looking for an alternative to my black coat; while my black coat is a great every day coat in the fall, my three cats contribute many a white hair to its exterior. Sugar and Pumpkin Spice Sweater -- You can't really go wrong with a cable knit sweater in a perfect autumn shade. Comfy post-Thanksgiving dinner sweater, anyone?